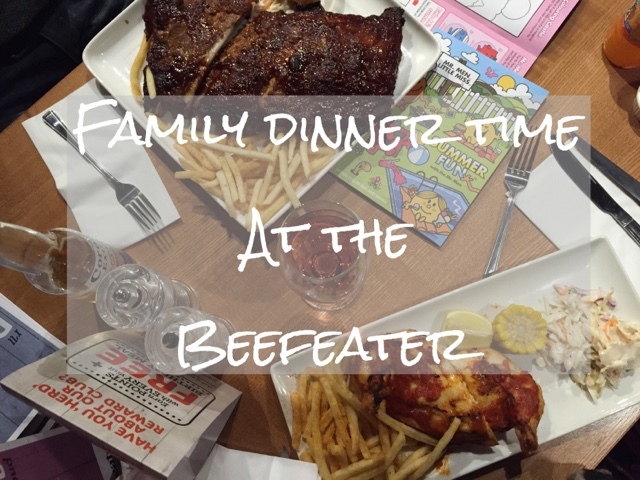 Last year my family and I were lucky enough to be given the chance to eat out at our local Beefeater. Since that time, The Plough has been refurbished so I was asked if we'd like to return and see the new look for ourselves. Now it isn't often we get to eat out as restaurant meals tend to cost a fair amount for our family of six. We were again given £50 towards our meal which made dining out a lot more affordable. Outside there were new logos on show, unfortunately I didn't get to take pictures of these as it was a tad too dark for photographs at that time but they definitely have a more modern feel about them. 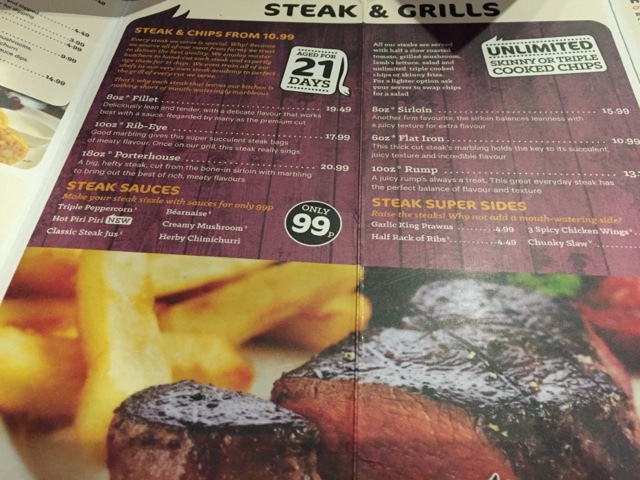 You can see an example of this from the menu pictured above. Walking in we were greeted by the manager and swiftly shown to our seats. Things looked relatively the same as they had previously in the foyer but I noticed a huge difference when I got upstairs. 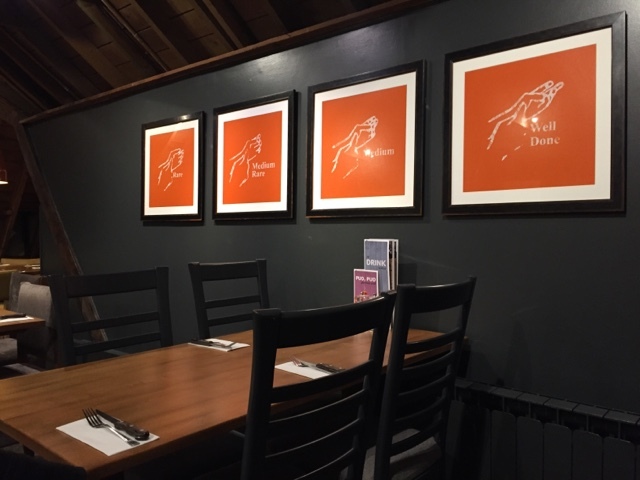 A fresh lick of paint, new canvases on the wall and up to date dining furniture, it all looked extremely inviting. And what my husband and I both noticed whilst eating was the nice temperature they kept the restaurant at, being Winter you don't want to be sat freezing whilst eating! 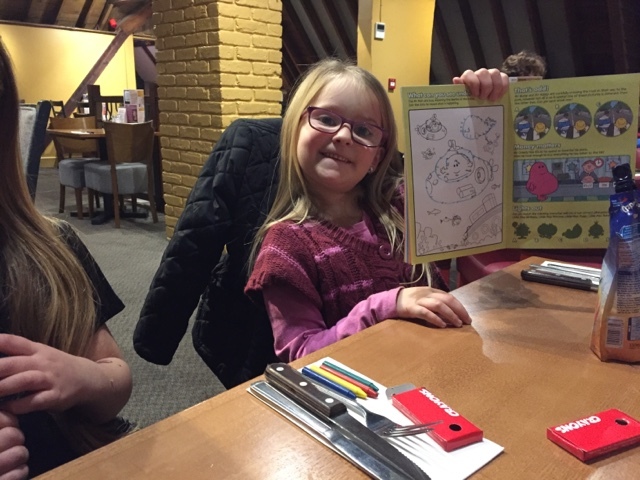 The kids were provided with colouring pencils and activity books as well as their own Mr Men menus, this kept them entertained whilst the adults got the chance to look at our own menus. 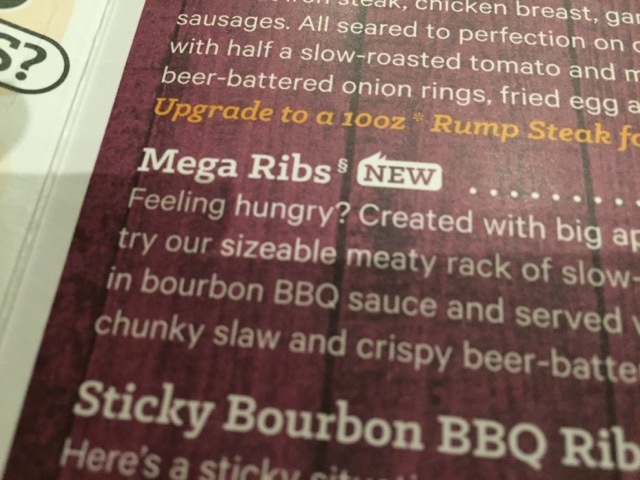 There were a few new things to choose from including different sauces and the new Mega Ribs which the hubby opted for. One thing that was a little annoying was that the dish I originally wanted wasn't available, it would have been nice if they could have informed us of the food that we couldn't order before making our choices. We weren't kept waiting long for the food we did order. Deciding on a couple of portions of onion rings for starters, we were given small plates to pop them on if we prefered and the plates were quickly taken away once finished with to make way for our main courses. I honestly cannot fault the over all service, our waitress was very attentive and polite. 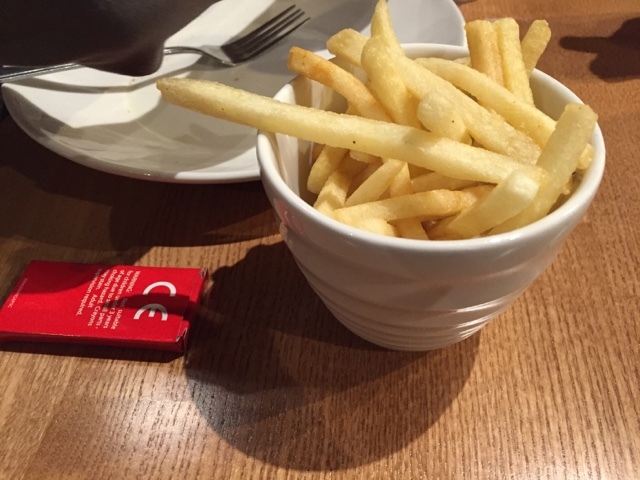 The kids were provided with smaller knives (without me having to ask) as they didn't need the steak knives and when my eldest daughter cleaned her plate, our waitress was on hand to offer her a free refill of chips so that she wasn't left empty handed whilst the rest of us continued eating our meals. The food itself was delicious. 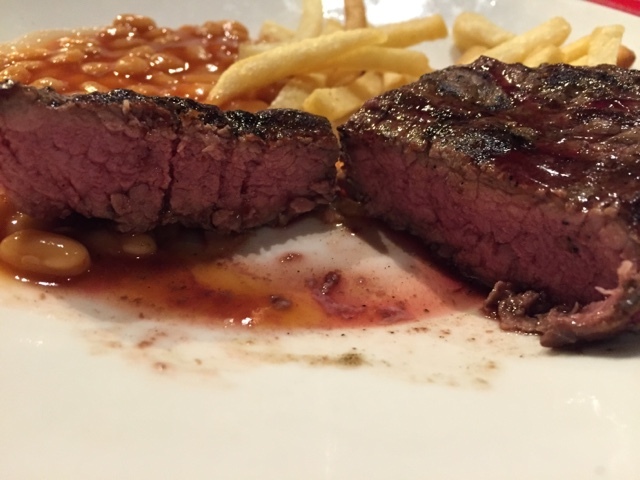 My 8 year old ordered the steak and as you can see from the picture below it was cooked to perfection. The children's dinners were all of a nice size and I like the fact that you can mix and match the sides if you don't like what it comes with to begin with, all mine opted to change their bake beans for peas instead. Then there was the Mega Ribs and boy they really were mega, I couldn't get over the size of them! I couldn't even finish my entire meal, so well worth the money charged for it. 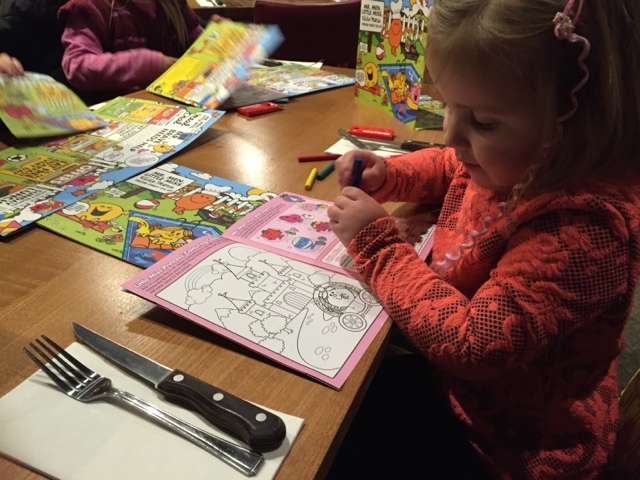 My youngest at the time waasn't feeling too great after having her pre school injections that morning, meaning we declined ordering puddings (boo I hear you cry). In the end our final bill came to £72, this included 6 drinks (2 alcoholic), 6 main meals and 2 portions of onion rings, so fairly reasonable in my opinon. As I said at the end of my last review, we will definitely be visiting again. 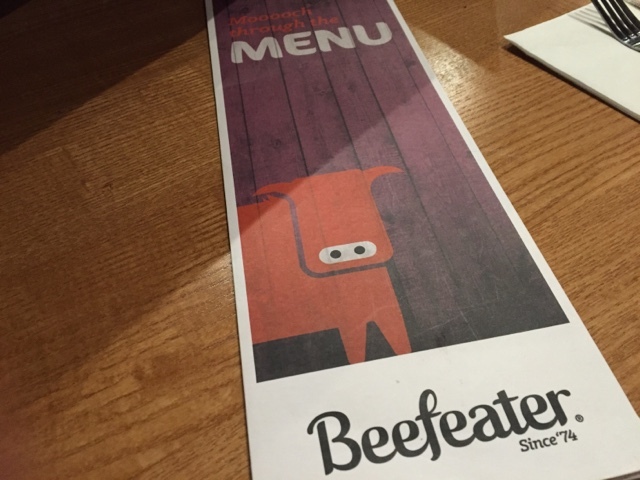 Great service, well cooked food and a lovely warming atmosphere, I'd highly recommend you check out your own local Beefeater. We love our local Beefeater. 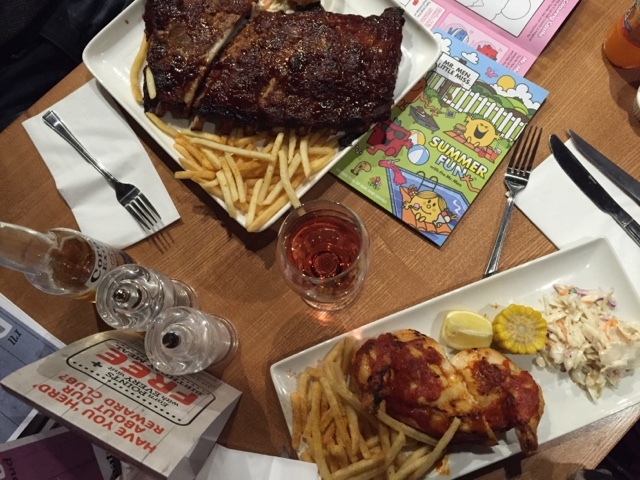 They food is great for all of us (2 adults, 1 who's gluten free, and 2 kids) there's always something we like. It's our favourite place to go eat to celebrate birthdays etc. I wonder if ours will get a refurb someday soon. 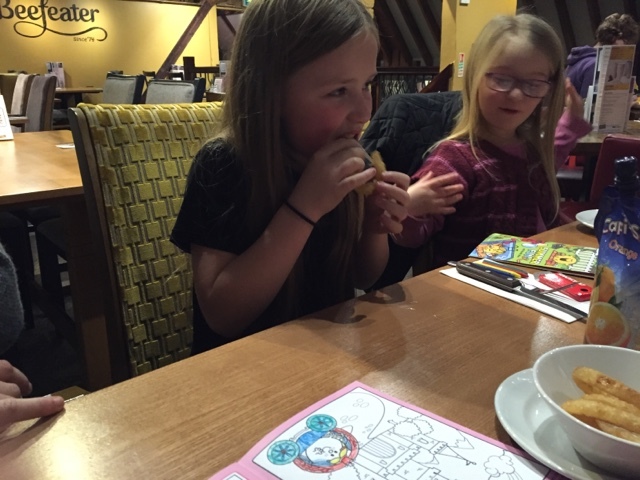 We've had some really enjoyable meals at Beefeater.